As a conspicuous evidence to constantly changing work trends during the past 50 years, the total number of jobs involving a moderate physical activity has dipped to a very low percentage today. Moreover, the over-dependence on technology and the escalating pressures in the corporate sector involves the employees to spend a large part of their waking hours on a chair glued to their computer screens or at nerve-wracking board meetings. Needless to say, this sedentary work culture is a practical problem for the majority of current workforce worldwide, because too much sitting causes life-threatening health problems. Is there a solution? The answer is: yes! 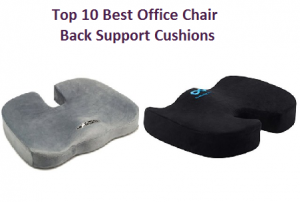 Read on to find out about the top 10 back support cushions for back and lumbar support that are giving the high-end ergonomic chairs a run for their money! It’s not an overstatement, it’s actually true. What Are The Essential Features To Seek In A Back Support Cushions? Before making an investment on a cushion, there are numerous considerations that you would need to keep in mind including the softness, the comfort, the way your cushion attaches to a chair, how light and durable it is and how to keep it fresh and clean. 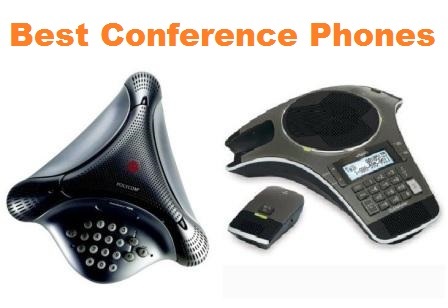 We have also written a complete guide about most comfortable office chairs. Material and softness play a vital role in determining whether a seat cushion would be a good fit or not. If the material is of a high-quality and breathable, it will go soft on your sensitive skin. A cushion that is too hard will make sitting painful and put pressure on the body. Too many curves in the cushion can make the posture awkward and can be just as terrible as sitting in a chair without cushions. Pay attention to the material and softness, and if possible test it out in real life before the purchase. Comfort is the most vital factor when it comes to choosing a back support cushions or seat cushion. It makes perfect sense to try and make sure that you are as comfortable and relaxed as possible while using the cushion. An ergonomically-designed cushion will help improve the efficiency at work, prevent aches and soreness and common day-to-day injuries. A proper support will keep sciatica, deep vein thrombosis, coccyx pain, varicose vein, and other hazardous health conditions at bay. Even though people use a seat cushion mainly for their office or home, these seat cushions can double up as a travel companion in long car rides and flights. That’s why the weight, shape, and size of a seat or support cushion matter. If it’s compact and convenient to carry, the cushion scores high on the portability attribute. People who work in a hot and congested environment tend to get sweaty, thus the aspect of sweat-resistance is an important criterion. Too much moisture reduces the life of a cushion. Few cushions are enclosed in a faux leather cover and you can easily wipe them clean. Some have removable fabric covers while others have sewed on fabric covers, thus, making them difficult to clean. Pick something that’s easy to clean. What Are The Key Advantages Of Back Support Cushions? Do you know how many benefits can support cushions fetch? People probably spend a lot of time concentrating on their demanding job sitting on their office chair rather than caring about their spine health. Frankly, the primary benefits people look for is a value for money and comfort for the body! However, there are a lot of other key advantages as well other than getting a good deal. Remarkable health benefits: Seat cushions do far more than just offering padding for the buttocks. They help support the spine and take the strain off certain muscles. A fine support cushion stimulates blood circulation and makes it easy to maintain a good posture. Support cushions have the knock-on effect of making sure that the head and the spine is at the right angle to glance at the computer monitor, and the arms/wrists and shoulders are at a correct angle while writing, typing, or scrutinizing files. Supporting the posterior chain has a good effect on the entire b ody alignment. Convenient to carry: Looking to stay comfortable in a long-haul flight? Or, do you need to go on a day-long car ride? The support cushions are lightweight and do not offer a bulky feel. The portability factor makes them easy to take in flights or cars, or just about anywhere you want to go. Great for individuals on wheelchair: Individuals who are confined to wheelchairs find immense relief from a seat or support cushion. As they are constantly in a seated position, their posture can aggravate their underlying health issues and even cause newer problems. They can benefit from cushions for a long term use and eventually a pressure sore reduction. The quality and comfort of your support cushion influence your health and efficiency. With numerous options, nonetheless, picking the correct one isn’t easy. The three categories mentioned below can help. Coccyx Seat Cushion: As inferred from the name itself, these cushions are perfect for supporting your tailbone (Coccyx). People who suffer from a tailbone pain can be greatly benefitted as these can assume the management of coccyx pain and improve the sitting posture. 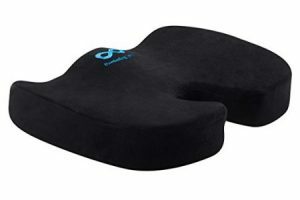 Lumbar Support Cushion: Lumbar support cushions are the ultimate choice for office-goers who spend a lot of time sitting in upright position. Individuals prone to muscles cramps as well as aches in neck, lower and upper back find these ideal as they offer great cushioning. Memory Foam Seat Cushion: Memory foam cushions are the most popular owing to their breathability, durability, hypoallergenic nature, cost-effectiveness, and performance. These orthopedic cushions are heavy-duty and obtainable in the preferred sizes, to be usable in different areas of support and places. The best seat cushion engineered to be a customers’ favorite! Aylio Coccyx seat cushion is the best seat cushion currently available and its makers have diligently designed and developed this premium product which takes the pressure off during work. It is a product of modern design and innovative thinking, crafted to add to the ergonomics of an office chair and offer a prolonged comfort. Aylio Coccyx seat cushion is a high-end cushion to be used at work, at home, during meals, attending meetings, or traveling by cars or airplanes. Aylio Coccyx seat cushion is a contoured foam cushion which is encased in squishy velvet fabric that feels soft to skin and doesn’t snag the clothes. The cushion is available in gray color and the plush velour coating is of an excellent quality that’s destined to last for years. U-Shaped cut-out design at the cushion’s rear suspends the coccyx or tailbone in perfect balance with the sitting surface and eliminates the aches associated with regular cushions. It prevents tingling or numbness in the buttocks, lower back, and legs caused by sciatica. The comfortable seat cushion follows the contour of buttocks and upper thighs, while soothingly aligning the spine and evenly distributing the body weight. Slouching back, slipped disc, inflamed or broken tailbone, labor-induced coccydynia – everything is taken care of by this seat cushion enabling extra cushioning and healthy circulation. Aylio Coccyx seat cushion is lightweight and portable measuring one pound with dimensions of 18 x 14 x 3 inches. It’s easy to carry anywhere for an extra support and comfort whether you drive to work, to the mall, on long rides, or on any of your upcoming overseas flights. Aylio Coccyx seat cushion is sweat-resistant and does not cause any discomfort even after an extended usage. The cushion lasts for a long time as its contoured design facilitates airflow. The plush washable cover enables easy cleaning. Just unzip the removable cover and wash it in a machine. The hygienic cover can be air dried for a fresh and clean feel. A premium orthopedic seat cushion for pain relief! Everlasting Comfort memory foam luxury seat cushion is crafted to relieve individuals from chronic sciatica, tailbone, or back pain and provide the balance they need. If you have a health condition or just want to avoid a potential health risk, this memory foam luxury seat cushion is durability and comfort rolled into one. Everlasting Comfort seat cushion is made of 100% premium quality and pure memory foam without any additives and is crafted from the same material produced by the world’s foremost memory foam makers. The visually-appealing black cushion has a versatile design and just the right amount of softness needed for office chairs, car, sunken old chairs, stadium seats, airplanes, or you can even kneel on it while doing household chores. The cushion is an Orthopedic surgeon recommended product and offers ultimate comfort and pain relief with its U-shaped design. It alleviates pressure on the hips, lower back, coccyx, tailbone, and more. The advanced memory foam seat cushion reacts to body heat and molds perfectly to the buttocks’ shape. The foam compresses enough to offer the comfort yet retains the shape to support the tailbone, spine, and hips. The cushion offers comfort to people suffering from sciatica pain. With dimensions of only 17 x 13.2 x 2.4 inches and a weight of 1.7 pounds, the cushion is ideal to carry and use for both fit and ailing people. Improve your seat padding in airplanes or cars and get an ideal support for back pain complications. Everlasting Comfort’s heavy-duty orthopedic cushion has great engineering and highest build quality with its best available construction memory foam. The heat responsive technology ensures the prevention of excessive moisture. When the foam senses body heat, it conforms to the body shape and creates a relaxed and dry sensation. The cushion comes with a removable and machine washable cover. A top lumbar support cushion to correct the posture! Everlasting Comfort Memory Foam Back Cushion is built with foam to offer comfortable support to the back. The compact cushion keeps the spine properly aligned to prevent sprain and pain in the lower back as well. 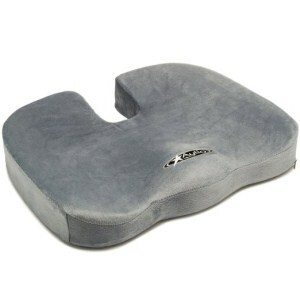 Simply put, this memory foam lumbar support cushion is a simple and clear-cut item that gets the job done. Everlasting Comfort memory foam back cushion is made of 100% pure and best quality memory foam. It is very soft, spongy, and conforms to your back keeping the spine arched. What makes this cushion stand out are the 3D mesh cover and high-density foam that offer good support without squishing over an extended usage. Everlasting Comfort back cushion offers comfort by particularly targeting back pain through the dual strap design and all-around curvy structure. The cushion with an orthopedic design can be placed along the back of a chair for a relief from upper, middle, or lower back soreness. The dual adjustable straps are better than regular back cushions with only one delicate strap which doesn’t hold the cushion in place. The dual adjustable straps are secured tightly to the seat’s back and it stays in the desired position and never falls or slides off the chair. The lumbar support cushion is 13.4 x 4.1 x 12.6 inches in dimensions and 1.6 ounces in weight. Being so lightweight and easy to carry, you can take it anywhere and just strap it for an extra relief. 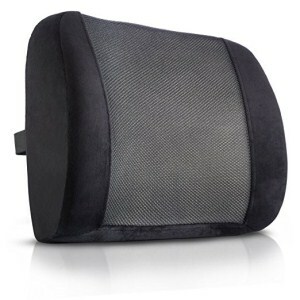 Forget about sweating with the hypoallergenic 3D mesh cover of this back support cushion. It permits airflow through the cushion to always keep the back cool and dry. The straps are quite sturdy and durable. The cushion itself is very well-made. Besides, it’s very easy to clean as well, there is a zipper and you can take out the foam insert and wash the cover. Bid adieu to back pain with perfect lumbar support! King Comfort lumbar support pillow is a superior product for desk/office chairs, recliner, car seat, wheelchair. It has the most up-to-date ergonomic design for finest back support to assuage pain and discomfort. No matter whether you’re strapping it to the office chair or a home chair, this support pillow will make your day much more relaxing. King Comfort lumbar support pillow has a top-quality plush black cover which is luxurious and soft to touch and also features a large breathable mesh panel. The pillow is made from Therafoam™, a high-quality memory foam that can withstand any amount of weight without sinking or losing its shape. The elastic straps are durable, extendable, and adjustable. King Comfort lumbar support pillow is a top-grade orthopedic back cushion that has been designed to offer an ultimate comfort to the customers. Users can now improve their posture everywhere as this cushion is very effective for lower back pain relief. The pillow is firm but not hard and provides comfort in nerve problems, hip and pelvis pain. The dimensions are 15.2 x 4.7 x 12.6 inches but the weight is 1.5 pounds which make it quite portable. It comes in a versatile travel bag, thus it’s easy to carry everywhere. The pillow is long-lasting as it’s carefully crafted from the resilient materials including a medical-grade memory foam that doesn’t flatten out like regular pillows. The build remains exceptional with years of constant use. The makers have guaranteed the pillow to be odor-free and its moisture-resistant plush cover has a breathable panel. The pillow doesn’t get sweaty in a hot weather. The removable cover is laundered easily. An orthopedic seat cushion for an optimal support! Innovative and artistic design, top-notch and contemporary ergonomics and a distinctive comfort, ComfiLife orthopedic coccyx seat cushion is a good fit for your car seat, office chair, airplane seat, stadiums, parks, wheelchair, rocking chair, and just about everywhere. ComfiLife coccyx seat cushion is the top memory foam seat cushion currently available in the market with its breakthrough design and high-quality resilient memory foam. The contouring material is spongy. Its unrivaled features include non-slip rubber bottom and a zippered velour cover that feels plush and soft to touch. The product is available in gray color. 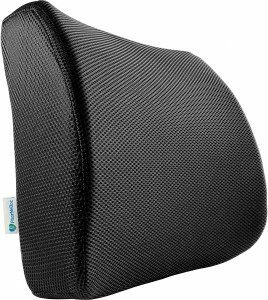 ComfiLife coccyx cushion’s elevated rear design offers optimal comfort, sacrum support and a healthy posture all through the day. It supports coccyx through an ergonomic design while reducing pressure on the area. It’s better than regular U-shaped cushions relieving hip pressure by accommodating the thighs and lessening leg numbness with a tapered front. The cushion assists users with sciatica and offers lower back pain relief. It offers comfort to users with herniated discs, back problems, tailbone injuries, Piriformis syndrome, pinched nerve roots, and other spinal issues. With a weight of 1.6 pounds and the built-in handle, the cushion scores high on the portability score and enables easy transport. Memory foam of ComfiLife coccyx cushion is heat and weight responsive and thus it’s quite hygienic, moisture-resistant, and durable. The firmness of the product changes with temperature. The cushion will feel soft in warm and firmer in cold temperatures. Room temperature is perfect for an optimal performance. The zippered velour cover is removable and machine-washable so no need to worry about the cushion getting soiled with daily use. A remarkable lumbar support pillow that’s got your back! is made in USA and has a resilient and high-quality memory foam. The material is designed to last even after years of daily use. PharMeDoc pillow has a fresh and innovative 2017 design with a mesh cover and adjustable straps. The lumbar cushion comes in five fun colors: black, blue, gray, pink, and brown. PharMeDoc cushion offers comfort, orthopedic lumbar support, and instant pain relief to the lower back and helps align the spine to its original position. 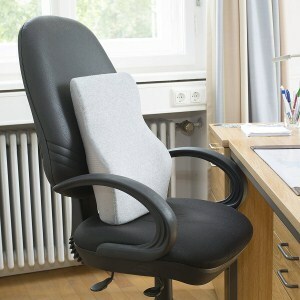 The wedge-shaped foam cushion is great for correcting the slouching posture caused by sitting for long periods of time. This supportive back pillow is ideal for users who work long hours, suffer from upper/lower back pain, coccyx pain, sciatica, fibromyalgia, those undergoing physical therapy, and the aged people. Portable size of 13 x 13 x 3 inches and weight of 1.3 pounds make it easy to carry your lumbar support cushion from the office to the car or home and even on the travels on trains, planes, and buses. Comes with a flexible and adjustable strap, so users can secure it into any seat. The lightweight back pillow fits a range of seats. PharMeDoc lumbar support cushion retains shape even after a heavy use. The pillow is odor-free, has a capacity to circulate air and keeps you fresh and dry all through its use. The mesh cover of the pillow is zipper-removable for swift and handy washing. It is as good as new even after quite a few washes. A coccyx pillow that offers ultimate comfort and support! The ventilated orthopedic coccyx back support seat cushion from Coop Home Goods can be a great fit whether you’re working long hours in your office or embarking on a long journey. Forget the pain from uncomfortable pillows and hard cushions with an ultimate coccyx support. Coop Home Goods’ unique coccyx seat cushion features the best memory foam that is infused with bamboo charcoal. No more fuss with the non-slip 100% polyester cushion cover that has little rubber feet and doesn’t slip and move from the seat like the regular ones. The non-slip bottom avoids it from sliding off. 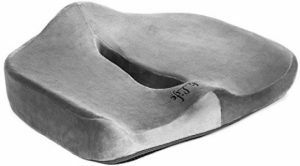 The orthopedic and specialized design is blended by the makers of this cushion to bring you the finest pillow to alleviate pressure on your coccyx/tailbone, hip, and back. The coccyx pillow is designed to offer relief to users who have undergone a surgery or elderly people. 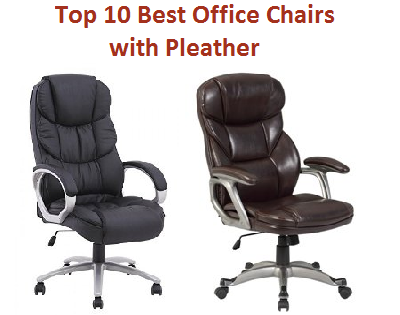 It aids in back and lumbar support and makes any chair, recliner, car seat, or wheelchair more comfortable. The pillow measures 17.5 x 14 x 2.5 inches and 1.5 pounds and the users can carry it across rooms, to their offices and everywhere else, whenever they need an extra support. The use of bamboo charcoal helps keep the cushion free of any stink and also controls humidity and moisture. The cushion is thermo-regulating. Get freedom from a hot seat. Stay pleasant and cool with the ventilated memory foam cushion with a breathable mesh that has been drilled to enable maximum airflow to keep you fresh. The machine washable cover helps improve its shelf life. The cover can be hand washed too. An ergonomic support to alleviate back pain! 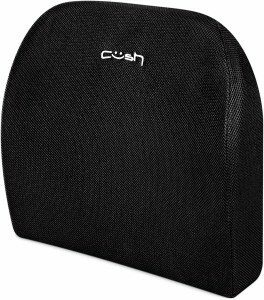 Cush Comfort extended reach lumbar support pillow should be your product of choice if you’re looking for an idyllic lumbar support with a wider coverage. It’s the top orthopedic gadget for a chair or seat support at your home, office, garden, or car. 100% top-grade pure memory foam without any fillers as the base material provides a soft and supportive posture accessory everywhere. The material feels soft to the touch and offers responsive support as compressed. The breathable black mesh cover with a non-slip backside having a special high-friction fabric helps keep the lumbar gadget affixed all day. An extra-wide and strong stretchable strap secures to any seat or chair semi-permanently. The proprietary and innovative Cush “double crescent” design conforms to you and your chair simultaneously within 30 seconds offering entirely distributed support to your thoracic and lumbar region. With a dedicated focus on optimal design, the Cush Comfort designers have conceived the “double crescent” design (a full 360-degree mould as opposed to standard lumbar supports with a “one-sided mould”) that fits properly into any chair, recliner, or seat. The pillow relieves lower back pain and provides a full spectrum support without awkwardly pushing and slouching you forward in your seat. Measuring 2.8 x 14.5 x 16 inches and weighing 1.6 pounds, the lumbar pillow is lightweight and easily portable. The well-ventilated mesh cover, memory foam, and adaptive base material with no fillers help absorb the heat from your body to mold it to an exact shape. Thus, the lumbar pillow remains quite sweat-resistant and hygienic. A nylon zip stretching along the length of mesh cover’s bottom makes it removable without difficulty and enables easy cleaning. 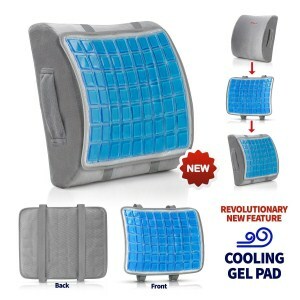 Instant lumbar support with the cooling gel pad! ZIRAKI 5 in 1 lumbar support memory foam cushion is a versatile support gadget for people looking for an all-round flexibility and functionality. Made with resilient and long-lasting materials, Ziraki lumbar support memory foam cushion serve as a preferable lumbar support gadget. The pillow features high-quality memory foam with a cooling gel pad and adjustable extender strap that can be affixed to any seat. The pillow remains quite soft and much changes aren’t noticed even after an extended use. Get two attractive covers, one plush gray velvet cover and one airy black mesh cover, both breathable and removable. Ziraki offers a soft yet firmly balanced memory foam pillow. The comfortable cushion conforms to the spine curve and gently supports the back. It instantly relieves back tightness, strain, and soreness. It’s neither too thick or too slender and can be used for hours at a time everywhere such as office desk, wheelchair, vehicle, or airplane. With this lumbar pillow, users not only soothe their exhausted and aching back but also improve and correct their posture with utmost support along the lower back’s natural arcs. It protects users from sitting in hurtful positions. Ziraki lumbar pillow measures 13 x 4 x 13 inches and weighs 14.4 ounces making it convenient to carry. Moreover, a sturdy travel bag is offered for easy portability. Ziraki memory foam cushion includes an innovative cooling gel pad to soothe your back and the cushion, so you’re never hot and sweaty. Put the pad on the cushion with the stretchable elastic straps and remove it just as easily. Light mesh-backed gel pockets offer instant cooling and keep you cool all through the day. Use the soft microfiber mesh case for more air flow when it’s really hot. During winter, enjoy the warmth of plush velvet cover. The covers are easily removable as a convenient zipper is offered for easy washing. A perfect lumbar support pillow for posture correction! Yermo lumbar support cushion is meticulously designed to present the ideal balance between firmness and comfort. The extended wedge shape fits just about any seat and offers relief from aches and soreness. Yermo lumbar support cushion has a high-quality memory foam that lasts for years even if you are using it constantly. The outer light gray cover is a top-grade fabric that withstands regular wear and tear. The adjustable straps enable you to strap the cushion onto any seat. Yermo lumbar support cushion’s memory foam offers the ultimate comfort and support as the foam swiftly molds into the body’s contour. This back cushion extends from the lower back (along the spine’s base) to the back’s midpoint. It greatly improves posture relieving back pain. It is just the thing for seats with inadequate lumbar support. Apart from acting as a back support, this support cushion can be used on the base of a seat to adjust the seating height. This helps in correcting the typing/reading posture or for improved visibility if the car seat is low. The lumbar cushion weighs 1.6 pounds and measures 11.2 x 10.5 x 4.5 inches and comes in a handy carrying bag so you can carry it across places whenever needed. The fabric cover is breathable, so the question of feeling too hot and sweaty is completely ruled out. The cushion restores to shape and therefore has a greater durability even if used daily. The machine-washable fabric cover can be easily removed for effortless laundering.